By Cazey Williams I’m a Starbucks aficionado in the most non-basic sense, which means I don’t order mocha chais or – God forbid – PSLs. The only time I get more exciting than a “Trenta iced coffee, light soy, light ice, unsweetened” is when I have a reward drink, and then I might – might – order some sort of frappucino with double espresso shots. I don’t do this more often because of the two C’s that dictate most of my dietary habits: Cost and calories. However, once upon a time, my friend introduced me to the Tazo (insert trademark symbol) Green Tea Frappucino Blended Crème (apparently that’s the proper name). I had a sore throat at that encounter, which added to my adoration. That frappucino happens to cost $4.75 if you order a venti (and why wouldn’t you?). If your heart palpitated at that, wait until you hear about the nutrition. It’s so bad that Starbucks is very sorry, but “the nutritional data for this product is not available online.” Thankfully, nutrition sleuths exist online, and they estimate calories for that venti at 420, which primarily comes 88 grams of carbohydrates. Carbs in themselves are not bad – but 86 of those grams are sugar. Yes, sugar. I just got diabetes. The iced green tea latte is loaded with similar sins. Therefore, I present to you my sweet Starbucks hack that is both cheaper and healthier. Order a Trenta shaken green iced tea (Teavana with the trademark symbol if you care – and a trenta because I always do) and ask for no water. When you order a shaken iced tea usually, Starbucks already has the tea made, but they then add water. Yup, they water it down. Right? What the heck is that? So when you say “no water,” they give you all tea. So then the barista asks, “Sweetened or unsweetened?” This is your choice. And I know aspartame comes out of the devil’s pores, but gosh, I love my Sweet’N Low and always ask for just one packet. Of course, this might kill me down the road, but not as fast as the 86g sugar overdose. Altogether, $3.28 on my gold card. Ka-ching. Here I am modeling with this heavenly creature we’ve created. Look at those chapped knuckles. Taylor Swift should cast me in a music video. Note how the color goes with the yellow foliage. 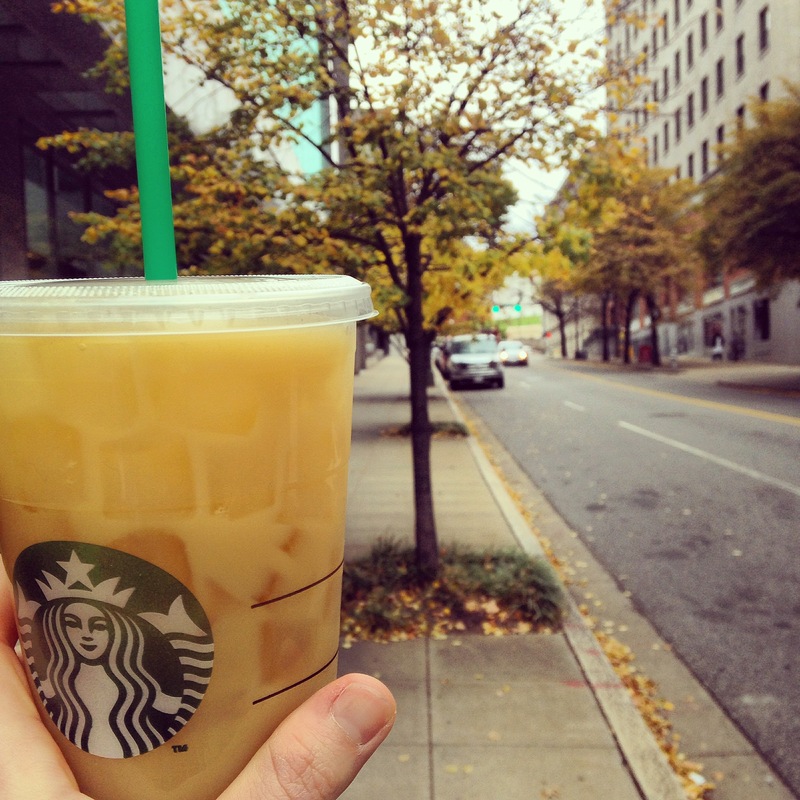 Yeah, I know it’s November; who wants an iced beverage? Well, I hope you burn your tongue on your steamed milk. Anyway, get to Starbucks fast, and let me know what you think!